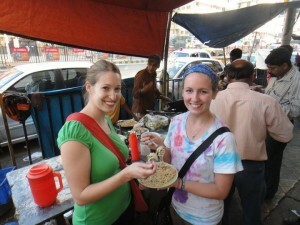 Kolkata is well known for its delicious street food, an essential part of the city’s life. These roadside delicacies are made in front of you in little makeshift stalls and are enjoyed by a hodgepodge group of businessmen, students, poorer people, and foreigners. Street food is a cheap treat that you can buy anywhere, from 5 to 40 rupees (less than $1), and it’s a great place to strike up a conversation with other street food junkies. In addition to street food, I wouldn’t be able to write about eating in Kolkata without mentioning some sweets. Bengalis are well noted for their love of sweets, which they have cultivated in a number of mouthwatering delicacies. 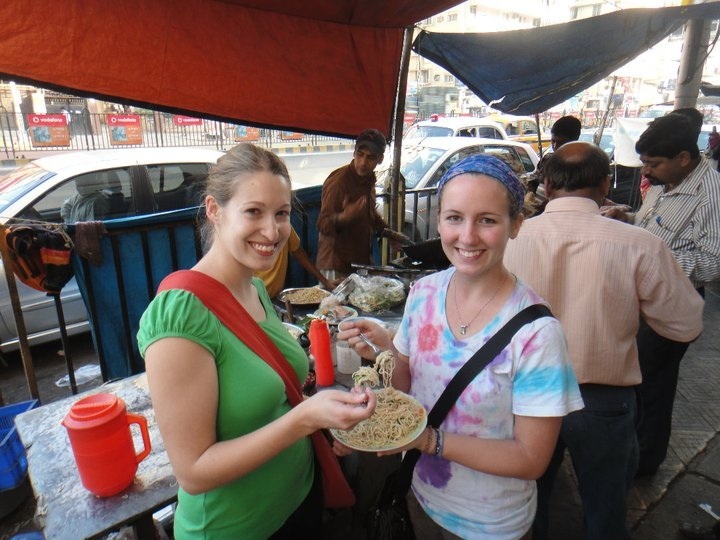 Health tip: If you haven’t been in India long (less than a couple weeks), it’s better to avoid street food since your digestive system may not be able to handle the less-than-sanitary roadside preparations. However, if you’re really anxious to have some street food, then make sure to eat food that is cooked hot and hasn’t been sitting out for a long period of time. Phuchka – a classic Kolkata street food. It’s a crispy puffed shell stuffed with a spicy mixture of potatoes, green chilies, cilantro, lemon juice, and tamarind (a pod seed with a sour or tart flavor, which must be soaked in water before using). After the phuchka is stuffed, it’s dipped into the tamarind water and you have to eat the whole thing in one bite or else the water will run down your chin. I like to have a few with water and a few without, and I prefer mine without too many green chilies. Egg Roll – a delicious and greasy treat. The vendors fry up a piece of tortilla-like dough, then crack an egg on top and let the egg fry. It’s quickly taken off the skillet and filled with spiced chicken, onions, green peppers, and green chilies with a little lemon or lime juice. You can get the roll without the egg or without meat. There’s a great egg roll shop right outside my school here, and I love to have a roll during my lunch break. Momos – this dish is not Indian in origin, but it’s a delicious, easy-to-find snack. It’s a steamed dumpling – simple flour-and-water dough wrapped around a vegetable or meat filling and steamed. It is often served with chili sauce (in case the momo doesn’t have enough kick already) or soup to dip them in. Momos also come pan or deep-fried. Pav Bhaji – this dish hails from the regions of Gujarat and Maharashtra in Western India. Pav means bread in Gujarati and bhaji means a curry or vegetable dish. The bhaji is a potato mixture made into a thick gravy with onions, green pepper, peas, and other vegetables simmered with a blend of spices. The bread is a basic white bun, like what you would find in America, and it’s buttered and browned. Serve the bhaji over the pav and enjoy. Chow Mein – Kolkata has a soft spot for Chinese cuisine, and Kolkatans often boast their Indian Chinese is better than authentic Chinese. This simple stir-fried noodle dish is available at a number of street-side stalls, and you can buy it in chicken, egg, or vegetable variations. Roshogolla is a traditional Bengali sweet. It’s made of chenna, an Indian cottage cheese, and flour rolled into a ball. The ball is then cooked in a sugary syrup and flavored with a little rose water. It’s served room temperature or colder, and the cheese ball is saturated with the sweet syrup. Essentially the same as roshogolla, Gulab Jamun is another popular dessert that is fried dough soaked in syrup. Roshogolla quickly has become one of my favorite desserts, and you only need to have one or two servings since there’s so much sweetness packed into one bite. Sondesh is a cheese dessert mixed with flour and sugar and formed into shapes. It’s less sweet than roshogolla since it’s not drenched in syrup. Mishti Doi is a sweetened thick yogurt. It’s made from milk, caramelized sugar, and a few tablespoons of yogurt that you let ferment overnight in the earthenware pot until it’s the desired thick consistency. Bengalis love their mishti doi, and for good reason. It’s deliciously smooth and creamy, and a great cooling end to a spicy meal. 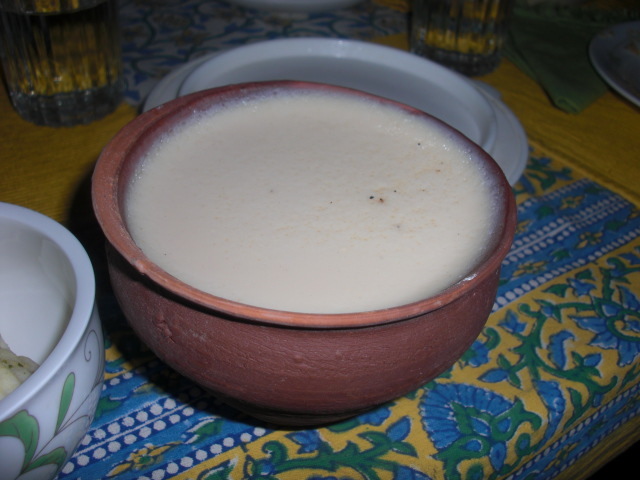 Payesh is a Bengali rice pudding (rice in a sweet milk-based sauce). Sometimes it has raisins or nuts. It’s usually made for festivals and other celebrations like birthdays. My host mother makes the best version I’ve tried. Hers has a little thinner sauce than other versions, which can be very thick and pudding-like. 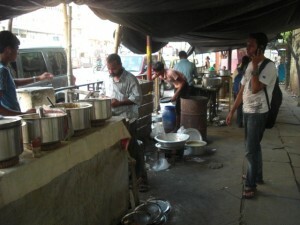 A good description on a very interesting subject, covering all the street foods of Kolkata. It is written in an easy, understandable English. I have enjoyed it as a person living in Kolkata.